The D&RGW unit has been unveiled, and is in Burnham today getting a little prep work before going into service. Kevin Morgan (among many others) was able to catch the unveiling on Saturday and posted photos [here], as well as a few more from Sunday morning [here]. I've got quite a few in my email, and as I get better network access, I'll get them posted. UP 1989, the D&RGW Heritage Unit, has arrived (tarped) in Denver for this Saturday's unveiling. A few pictures have started popping up. The underframe is silver, and at least the pilot is good old D&RGW Aspen Gold. 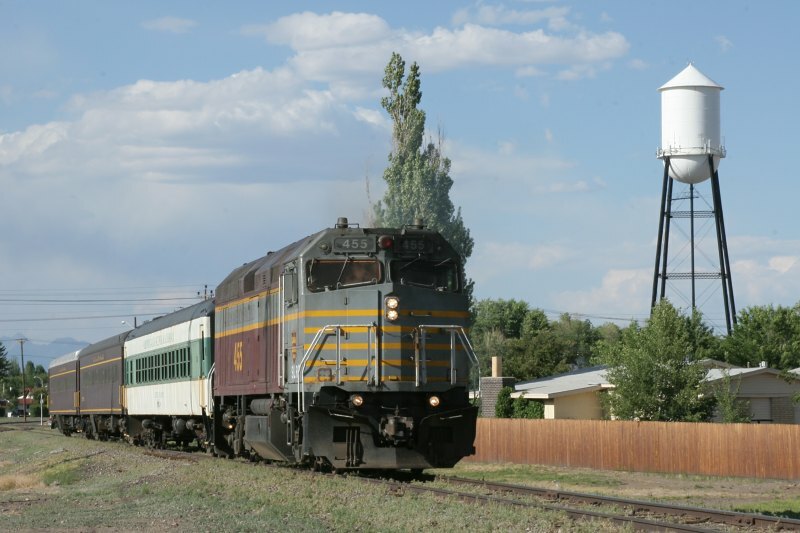 Probably the most interesting ones are on Paul Birkholz's Mountain West Rail site [here]. A peek through a break in the tarp shows something that looks like a modification on the classic four-stripe F unit scheme. Or it may be orange stripes on a black unit. For those with access to Trainorders.com, there's a thread on the unit, along with pictures from "Pinlifter" [here]. Let the speculation begin! The D&RGW Heritage SD70ACe is out of the Horicon paint shop and moving west towards Denver. Yes, it's tarped, but the bottom is silver and the front pilot is aspen gold - very close to the color used on the F and PA units. It looks like rumors of it being based on the classic single or four stripe paint schemes have some truth to them. There's a photo of it on RailPictures.net (warning, set your pop-up blocker to overdrive...) [here]. If anybody catches it, I'd appreciate any photos you happen to get. I'd like to compile a photo album of its journey from EMD plant to unveiling (Denver, 17-Jun-2006) to first run.